"The human body's first line of defense against bacteria are certain white blood cells called neutrophils," says J. Scott VanEpps, M.D., Ph.D., assistant professor of emergency medicine at Michigan Medicine. 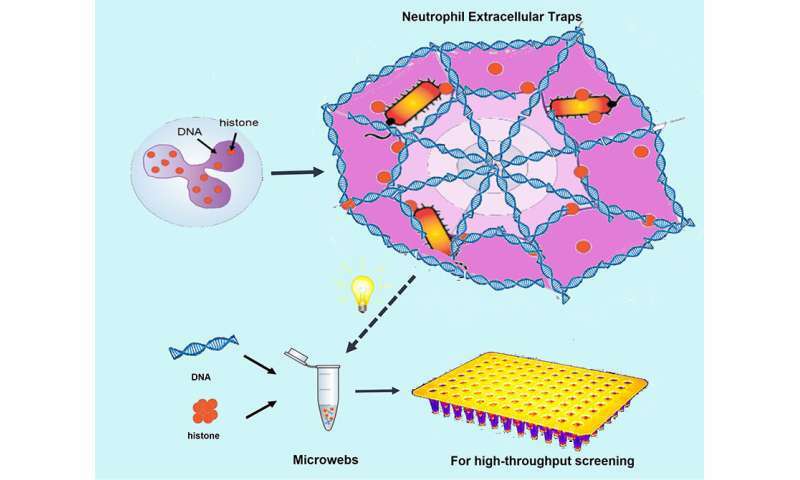 "One of their weapons are neutrophil extracellular traps, also called NETs." "The exact function and mechanism of NETs remains a bit of a mystery likely because they have different functions for different situations," he says. "And it's very hard to isolate these NETs in the laboratory and study them in detail." "We were hoping to provide a bottom-up engineering approach to better understand how the immune system fights bacteria, specifically the immune system's weapon: NET," says VanEpps, associate director at the Michigan Center for Integrative Research in Critical Care. "Although there are literally hundreds of different ingredients in natural NETs, we were able to recreate a lot of their structure and function with just two ingredients and determined the optimal ratio of those ingredients," he says. "They look and function very similar to NETs produced by those neutrophil white blood cells and the synthesis method is much simpler than isolating them from neutrophils." "We studied how our microwebs capture E. coli and found they could also kill it," VanEpps says. "This led to us examining how microwebs might play a role with antibiotics. "Importantly, we found that the dose of antibiotic required to kill E. coli (including a colistin resistant strain of E. coli) was less when our microwebs were present." VanEpps' co-senior author, Shuichi Takayama, Ph.D., a professor at Georgia Tech, says the findings are an example of teamwork. "This research was an outstanding team effort," Takayama says. "Microbiology from the VanEpps lab, NET-like materials contributions from the Moon lab, NET expertise from the Knight lab, colistin resistance expertise from the Weiss lab and Yang Song, Ph.D., leading the effort, made this all come together." "Now that we have a platform, we can synthesize microwebs with different NET components to more precisely describe how the immune system uses NETs in different situations," he says. This understanding of the body's natural killing of bacteria could also help in developing new treatments for infections. "The knowledge gained in this study could be helpful in the future in designing new and better antibiotics that mimic the body's natural defense mechanisms, as well as potentially change how we dose antibiotics given the potential synergy between the immune system and certain antibiotics," VanEpps says. "That's critical as we have not developed a new class of antibiotics in over 30 years and resistance continues to increase."